Andrew wants to hear from YOU! Share your thoughts about his Live CD. ALL emails WILL get a personal response! CDs are shipped within just 3-4 business days. Standard s/h is just $3 for US domestic delivery and $7 for International delivery. "Yes, You Can! [Do ANYTHING]" features more than an hour worth of live talks, narrations, and emotional stories that have continued to inspire audiences worldwide. 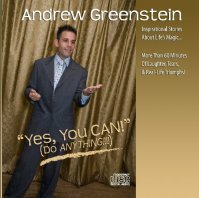 Andrew Greenstein's uniquely calm, entertaining manner enables his very personal messages to reach audiences on levels proven to move, motivate, and uplift. "I really enjoyed how the CD was so family-oriented. 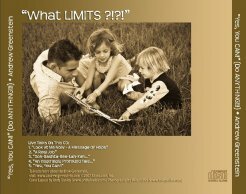 Your heart and emotion are VERY rare nowadays w/ regard to success trainers & speakers. You are an excellent role model." 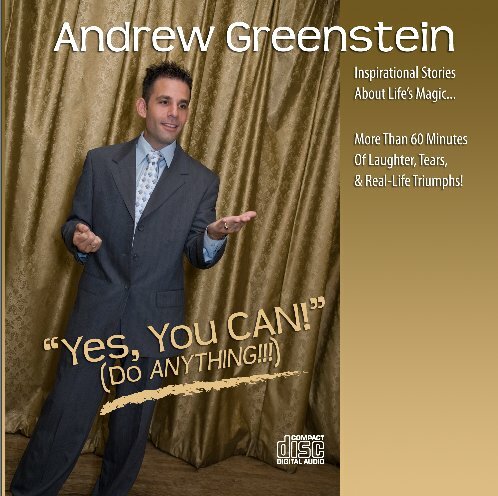 inspirational CD for only $9.95! "What an inspiring CD. AWESOME! My family really admires you!"